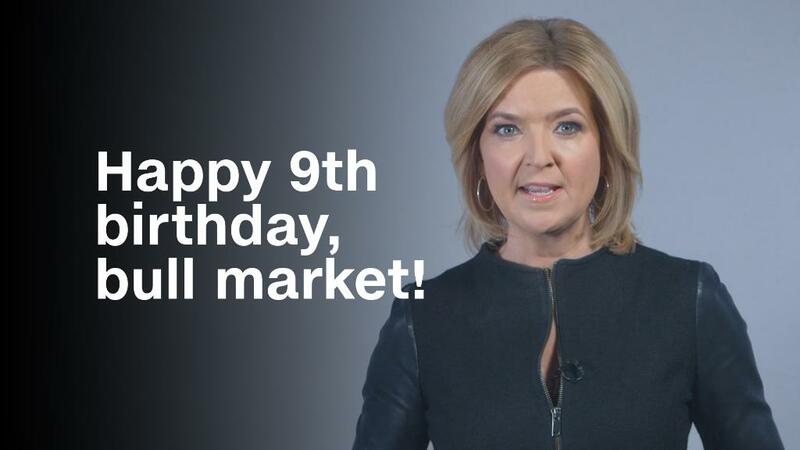 Happy 9th birthday, bull market! The jobs report was exactly what Wall Street wanted. The Dow surged 441 points, or 1.8%, after the Labor Department reported that the economy gained 313,000 jobs in February. The Nasdaq closed at a record high, gaining 1.6%, and the S&P 500 climbed 1.4%. Investors were watching the Labor Department's wage growth number closely. Wages grew 2.6% in February compared with a year before. That's less than economists predicted and slower than the 2.9% rise in January, which set off fears on Wall Street about rising inflation and the possibility of interest rate hikes. The Dow tumbled 666 points when last month's jobs report landed. "Overall the February jobs report is the best of both worlds -- strong job growth without accelerating wage inflation -- It's not too hot not too cold, a Goldilocks report," said Alec Young, managing director of Global Markets Research, FTSE Russell. PNC chief economist Gus Faucher said the report was more proof that the job market is tightening, putting pressure on employers to increase wages. That could lead to higher inflation down the road. For now, though, investors believe the more modest wage rise signals runaway inflation hasn't arrived. "The market is hyper sensitive to inflation and signs that inflation is climbing higher at a faster pace," said Quincy Krosby, chief market strategist at Prudential Financial. Slower wage growth could ease short term concerns that the Fed will be forced to speed up interest rates to cool down the economy. "The probability of four rate hikes this year increased last month a bit after the January jobs report but I think it still stays near three," said Katie Nixon, chief investment officer for Northern Trust Wealth Management. Higher rates mean borrowing money becomes more expensive. Wall Street has feasted on cheap borrowing costs, low inflation and tepid growth since the financial crisis. The bond market also took the jobs report in stride. Yields on the 10-year U.S. Treasury note held steady at around 2.88%. Yields rose sharply earlier this year due to concerns about inflation and a more aggressive Fed. Wall Street doesn't want to see a spike in yields that would make risky stocks a bit less attractive than safe bonds. Ryan Detrick, senior market strategist for LPL Financial, said the report was a positive sign for the market. "Over the past week we've been hit with a potential trade war and the top economist at the White House stepping down, but stocks have really taken all of that in stride," he said. Chevron (CVX), Caterpillar (CAT) and Intel (INTC) were the day's biggest winners. —CNN's Matt Egan contributed to this report.